When Christie’s announced it would be auctioning off its first AI-generated portrait, the fine arts company expected the piece to sell for less than $10,000. Much to everyone’s surprise, it sold for much higher: $430,000, to be exact. The portrait, which the BBC describes as “grainy and unfinished,” raised questions about the role of technology in art. Does machine-generated art really count as “art”? Does this mark the beginning of a new movement? Who should the art be credited to, the machine or the maker of the machine? BBC writer Thomas Graham, for example, argues that since the “AI did not produce the artwork alone,” it is therefore “not creative in any human sense.” But others see it differently. 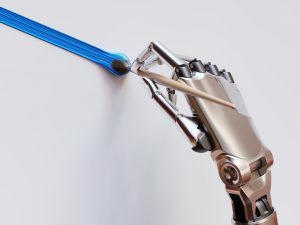 As the English comedian Ben Elton once said, “Artists don’t create society, they reflect it.” From this perspective, it can be argued that the makers of the AI machines are artists, given that they are offering future generations a glimpse into the world as we are experiencing it today. Mario Klingemann, one of the first artists to implement AI in his work, doesn’t believe this type of technology poses a threat to traditional artists. Rather, he believes it poses a unique opportunity for artists to work in conjunction with AI to invent a whole new style that’s never been seen before. Tell us: Do you think AI-generated art should be valued the same as traditional art? Leave your comments below.